Two layers of kraft paper bonded with a seperate layer of bitumen. Kraft union rolls with waterproofing protect heavy engineered components in transit. Useful when exporting and lining large corrugated or wooden cases. Product description: Two layers of kraft paper bonded with a seperate layer of bitumen. Kraft union rolls with waterproofing protect heavy engineered components in transit. Useful when exporting and lining large corrugated or wooden cases. Description: "Photo of Kraft Union paper"
Kraft Union Paper. Two layers of kraft paper bonded with a seperate layer of bitumen. 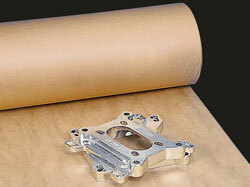 Kraft union rolls with waterproofing protect heavy engineered components in transit.